Laguna Beach High School’s CIF third-ranked girls’ cross country team was perfect at Orange Coast League finals, taking the top five spots and seven of the top eight to easily beat runner up Godinez 15 to 54 for the title on Wednesday, Oct. 29 at Irvine Regional Park. The fifth-ranked boys’ team was nearly as dominant, placing its five scorers in the top 12 to outpace Godinez 28 to 56. Senior Brenna Merchant, who last month was crowned Homecoming Queen, won the individual title with a personal record time of 18:17.00, the fastest ever by a Laguna runner on the Irvine Regional Park course, breaking senior Natalie Kimball’s course mark of 18:19.30 set last year when she won the league title. Laguna’s next three finishers, sophomore Kirsten Landsiedel (18:28.13), junior Pearl Shoemaker, Pearl (18:29.53), and senior Janie Crawford (18:33.06) also set personal records and now rank 3, 4 and 5 on the all time list at Irvine Park. Kimball (18:45.47) rounded out the top five. Junior Taylor Alvarez (19:03.62) and freshman Grace LaMontagne (19:04.17) finish seventh and eight overall respectively. 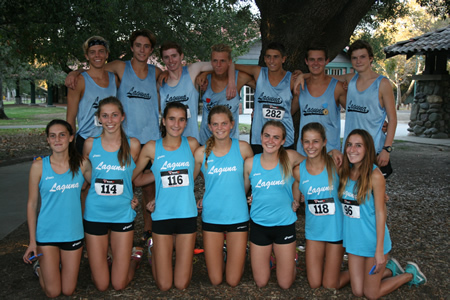 Senior Cameron Zuziak finished first for the Laguna boys and second overall with a time of 15:27.23. Following him were fellow senior Grant Barton (15:36.32) and junior Penn Nielson (15:53.14), who finished third and fourth. All three set personal records and are now ranked 2, 4 and 5 on the school’s all-time list at Irvine Regional Park. Junior Mason Pitz (16:12.17) and Drake Butler (16:29.00) rounded out the scoring five and now occupy the sixth and seventh spots on the all time list. Junior Lauryn Alvarez finished first overall and set a new PR of 19:36.20 to lead the JV girls to victory over Godinez 21 to 40. All five Laguna scorers finished in the top seven overall, including sophomore Greer Jacobs (3rd, 20:28.59), junior Allison Konno (4th, 20:34.67), senior Annie Brown (6th, 20:52.04) and sophomore Sabrina Flagstad (7th, 21:03.26). Sophomores Jake Mangus (2nd, 17:08.25) and Sam Dameshek (4th, 17:36.90), and freshmen Massimo Lucidi, Massimo (9th, 18:11.52), Dylan Miller (10th, 18:14.41) and Jaden Orr (11th, 18:15.28) combined to lead Laguna’s frosh/soph team to victory over Godinez 34 to 43. Junior Tim Andrews excelled for the third place JV boys, finishing second overall with a time of 17:05.68. Rounding out the scoring five were junior Daniel Peterson, Daniel (13th, 18:38.77), and sophomores Michael Sivetts (14th, 18:46.96), William Kramer (18th, 18:54.11) and Ryan Marx (20th, 18:59.54). The varsity squads head to Mt. SAC in Walnut for CIF preliminaries on Saturday, Nov. 15.